Question 55. Given a set of coin denominations, find the change for a given amount using the least number of coins. For instance, suppose the coin denominations are 4¢, 5¢ and 7¢, then to get 13¢ using the least number of coins, we need to pick two 4¢ coins and one 5¢ coin. Let us say that coin denominations are 1¢, 5¢ and 25¢. We can use a greedy approach as follows – Pick the maximum number of coins with the highest denomination and then the maximum number of coins with the next highest denomination and so on. So if we have to pick the change for 58¢, we pick two 25¢, then one 5¢ and finally three 1¢. So we use a total of 6 coins. Greedy approach produces the optimal result for this set of coin denominations. However, given any arbitrary set of coin denominations, the greedy approach will fail for many cases. For instance let the denominations be 1¢, 3¢, 4¢ and 5¢. If we use the greedy approach to get 7¢, we use one 5¢ and two 1¢ thereby requiring three coins. However the optimal solution needs only two coins (one 3¢ and one 4¢). So the minimum number of coins for 7¢ is 2 coins. 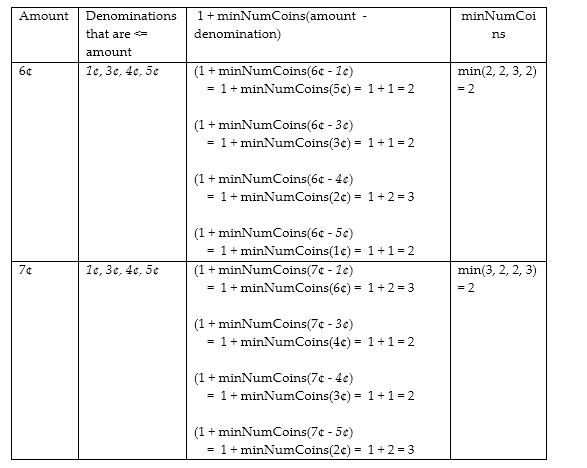 If the final amount is m and there are n denominations, the time complexity of this approach is O(mn).